The Isle of Skye was enchanting. Both Helen and I had been wanting to visit for a long time, so it was fun to explore somewhere new together; it's something we did lots of when we were studying abroad. By traveling at the end of October/early November, we had just entered the off season. There were pros and cons to traveling then — on one hand, nothing was crowded at all and it felt we got a more authentic Skye experience (apparently during the summer it can feel completely overrun by tourists at times). On the other hand, it's much tougher to get around, and not everything on the island was open. It's okay — just a reason to go back during the spring or summer! With it being the offseason, we decided the easiest way for us to get to and around Skye was by taking a private bus tour — public transportation would be too unreliable and renting a car was too terrifying. 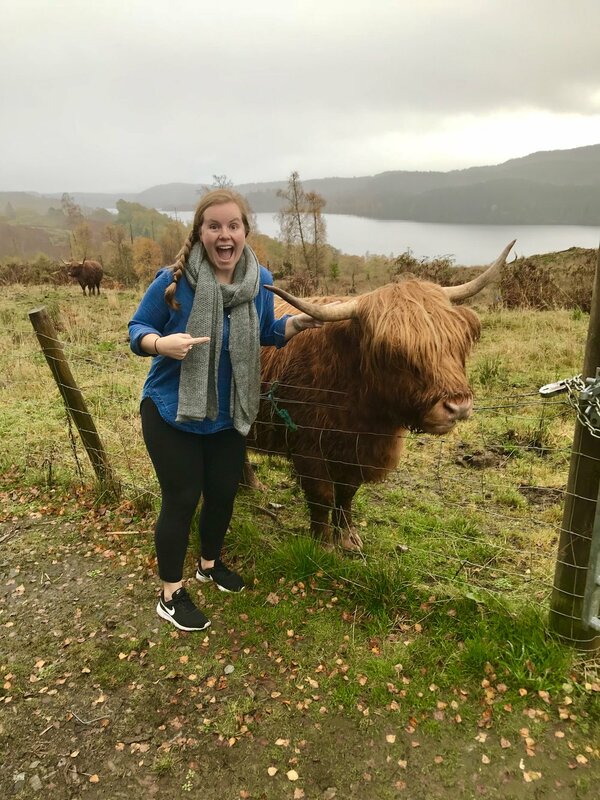 We booked a three-day excursion through Rabbie's Tours, the same company we used to see Loch Lommond in 2014; our group was small, just us and maybe 10 other students studying abroad in the UK from different areas of Asia. It's a lot of driving, but between plenty of stops at landmarks, gorgeous landscapes passing us by, listening to Harry Potter on audiobook, and seeing a HIGHLAND COW, it was a lovely road trip. Seriously, that cow... our driver saw it and pulled the bus over so we could see it. When I realized what we were stopping for, I gasped so dramatically that I hurt my throat. I was thrilled to see it. We stayed at the Portree Independent Hostel and ate at a few local places. They were good, but not totally memorable, so I couldn't actually tell you what they were called. We were there on Halloween, and one of the places really went all out with the decorations, which was fun! Again, off season bummer that many of the places in Portree were closed. It seems that the main point of going to Skye is to commune with nature. And commune we did. We stopped by Glencoe and heard the story of the massacre of Clan MacDonald (which, allegedly, was the inspiration for Game of Thrones's Red Wedding). Saw a rainbow at Culnacnoc. 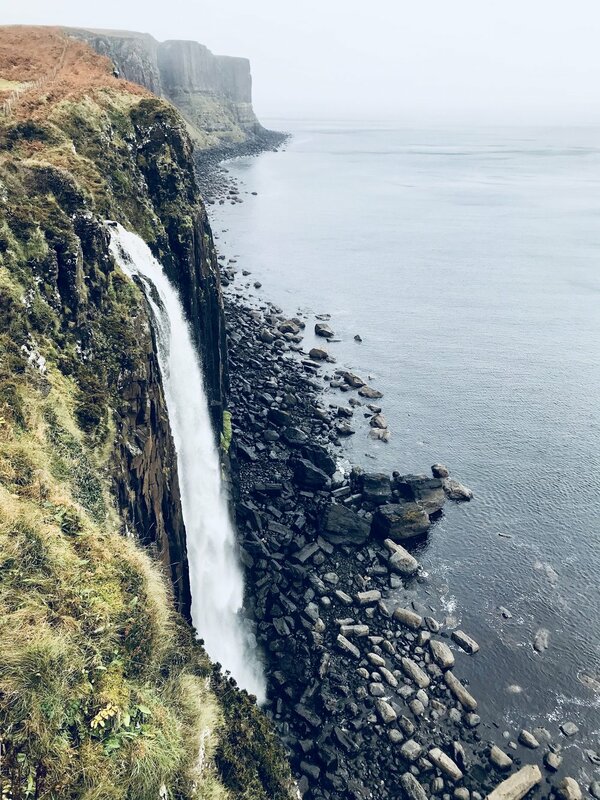 Felt the spray of a waterfall and wandered a little too close to the edge at Kilt Rock and Mealt Falls. 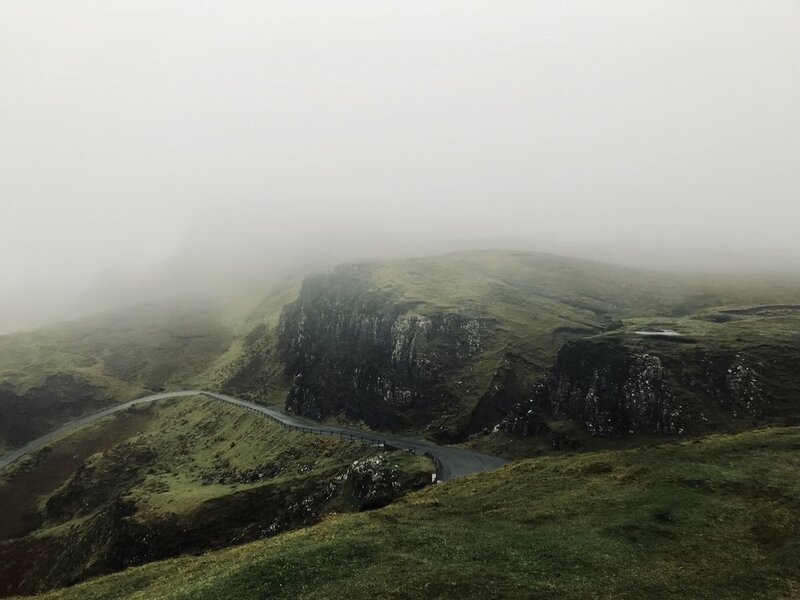 We took the most dramatic drive to the Quiraing Mountain Pass and nearly got blown off the top of the mountain in the wind. Hiked down to the beach in Staffin. Watched the sun set over the lighthouse at Neist Point. Visited Eilean Donan Castle, made famous (to me at least) by being where Kevin McKidd's family lives in the move Made of Honor. Lunched at Loch Ness on our last day (no Nessie sightings, unfortunately). We experienced nearly every type of weather possible save snow — sun, rainbows, fog, rain, wind. The light would shift on a dime, meaning that photos taken in the exact same spot look different if they were taken even 60 seconds apart. It was completely captivating. Skye feels like a place you could return to again and again and absolutely never have the same experience. 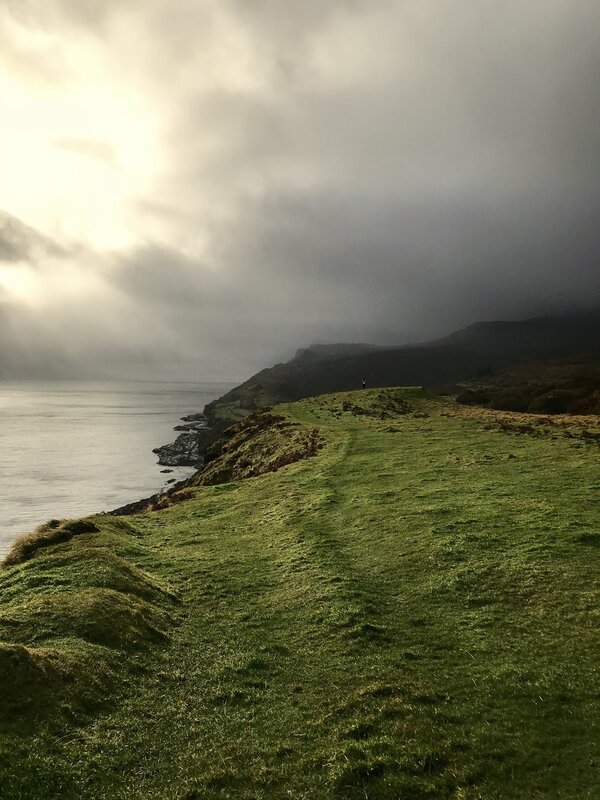 When I go back again and see rain at Culnacnoc and a rainbow at Quiraing, when I witness only a few hours of daylight in the depths of winter versus unceasing sun during the summer months, even when a different fish is in season to serve at the restaurants — it will feel like a completely new place. It is part of the magic of a place where the focus is on the land, a place where they still believe in fairies. It is a magic I will return to. And, a little side note about Edinburgh, where we stayed the night before/after our trip — I have two recommendations of places to go, one for drinks and one for dinner. The Devil's Advocate was cozy (down some steps in a close, exposed brick, bowtie-clad servers) with a fantastic cocktail menu. The Outsider was a stellar choice for dinner. We had a ton of sensational food (including mussels for the 1 millionth time in Scotland and a stellar gnocci) for a totally reasonable cost, and they had the most irreverent and hilarious wine menu I've ever seen. For example one of the reds had the description, "Until I was ten I believed that I arrived in the world with my brother floating down the river in wicker baskets whilst my mother and father were on a church picnic. I've since become a less gullible atheist. A bundle of soft, plummy fruits." Like...WHAT!? We were cracking up reading the entire menu. Highly recommend!